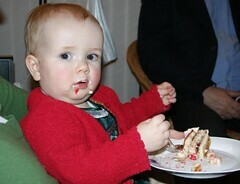 On Friday daddy made me cake, and my grandparents flew over from Denmark and my other grandparents came for coffee too. Everyone bought me nice presents. Apparently it was something called 'my birthday'. Mummy says I am one now.